On Christmas, my husband made fun of me for posting the above photo on Instagram. He said it was blurry. I couldn’t disagree but said it was merry. Then, I realized that sort of summed up not only our Christmas but the majority of our year with a baby: blurry but merry. The hard stuff from the early days is the blurriest (I think there was a solid stretch with no sleeping, but I can’t remember) while each new milestone seems to shine brighter than the last (Will just started giving kisses on demand—slobbery, open-mouth ones but still, kisses!). Here are a few moments when time stood a tiny bit still during our merriest, brightest, blurriest holiday of all. 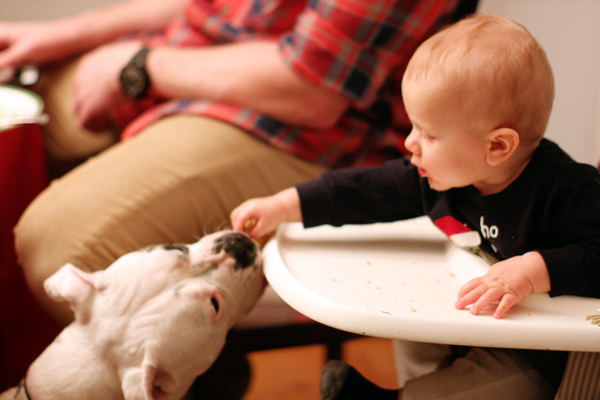 Christmas magic unfolded right at the dinner table when the dog and baby realized there could be so much more to their relationship. In case you’re wondering, that’s a handful of buttered bread. This sweater was last worn by my husband in Scotland circa 1982. I’m so glad his mom held onto it all of these years and brought it out on Christmas morning! 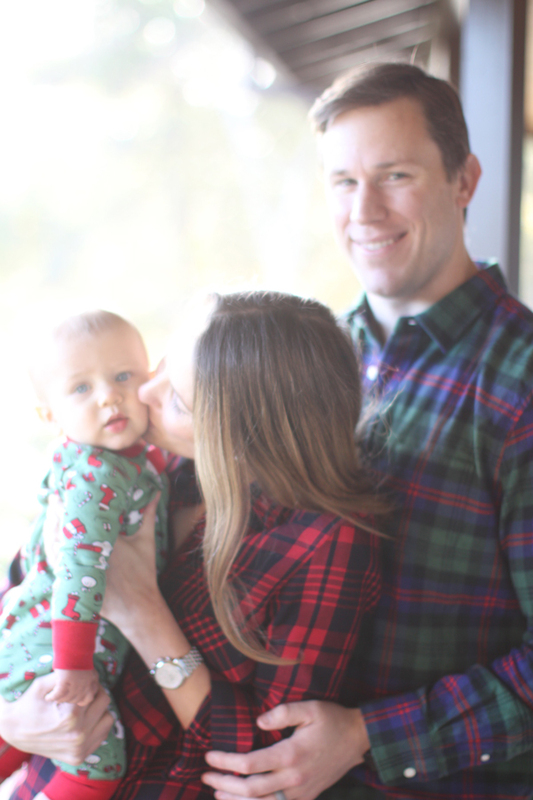 On Christmas Eve, I asked my husband to take a picture of me nursing Will. It’s a huge part of my relationship with my son but rarely captured on camera. I had no intention of sharing it but I am because 1) I’m not wearing pajamas and 2) sometimes nursing is really draining but sometimes, it fills up both of us. And now it’s time for a new year. I’m a bit sad to leave this one behind—it was so big. We rang in 2015 with alcohol-free wine and welcomed Will into the world in April. We said goodbye to my husband’s grandmother and also the home that she so generously let us call our own for more than two years. We found a home with a red front door and a kitchen counter that fits two stools and a highchair perfectly and officially became homeowners. We had time off from work, went back to work, and took on new roles at work. 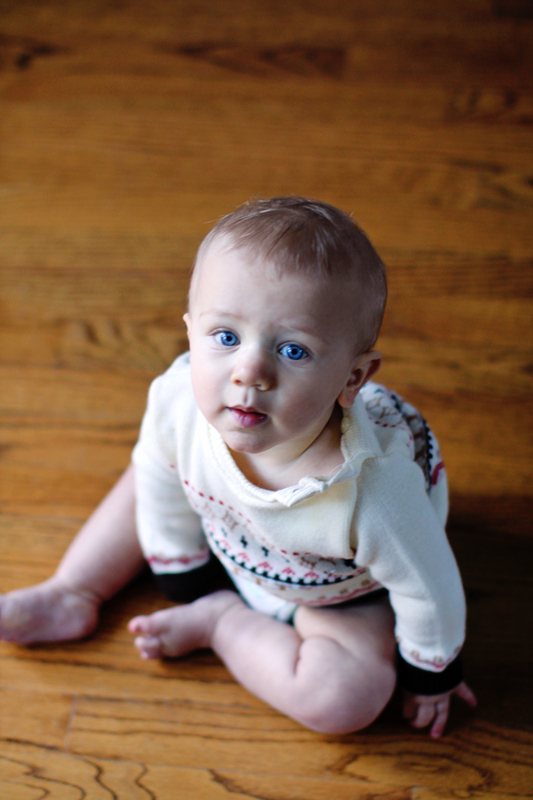 But if there’s one thing parenthood has taught me so far, it’s to go with the flow—so 2016, here we come!